In pharmaceutical continuous manufacturing technology, active ingredients are produced in compact, closed units, leveraging automation. Hence, it requires fewer manual interventions. Production steps carried out sequentially in a classic batch process are combined in a continuous process. All these help to bring about continued utilization of production capacity. This in turn serves to reduce fluctuations in production, improve yields, and lower costs of operation and equipment. On account of such advantages, the method is seeing fast adoption. Other advantages of pharmaceutical continuous manufacturing technology is the superior development speeds, higher process safety when employing hazardous chemistries, and the opportunity to perform reactions that cannot be run under batch processing. 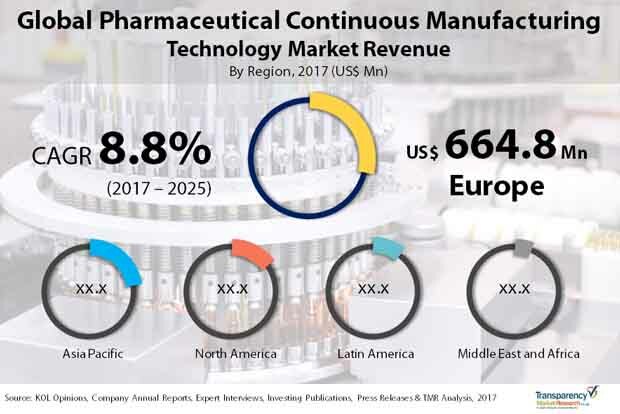 A study by Transparency Market Research forecasts the global pharmaceutical continuous manufacturing technology market to expand at a healthy CAGR of 8.8% from 2017 to 2025. Expanding at this pace, the market which was worth US$1.74 bn in 2016 is expected to attain a value of US$3.693 bn in 2025. Some of the key application segments of the global pharmaceutical continuous manufacturing technology market are biologics, dry powders, active pharmaceutical ingredients, etc. Of them, the segment of biologics accounts for a dominant position in the market. It held a share of about 35.3% in the global market in 2016. It was trailed by active pharmaceutical ingredient. Application-wise, the global pharmaceutical continuous manufacturing technology market can be divided into contract manufacturing organizations, pharmaceutical companies, etc. Currently, pharmaceutical companies lead the market with maximum demand and are trailed by contract manufacturing organizations. In the near future, the contract manufacturing organizations in Asia Pacific region are predicted to fuel market growth majorly. Along with increasing awareness about the technology, various initiatives by FDA are also egging manufacturers to shift to continuous manufacturing over batch manufacturing process. From a geographical standpoint, currently Europe dominates the global pharmaceutical continuous manufacturing technology market. Strong demand for advanced technology from pharmaceutical companies and presence of many contract manufacturing entities has majorly fuelled the market in the region. The growth in Europe is primarily powered by the U.K. and Germany. The region’s leading share in 2016 came to around 35%. The market in the region is also expected to outshine others in terms of growth by registering a CAGR of 9.6% in the forecast period. Expanding at this pace, it is predicted to clock a revenue of US$1.38 bn by 2025. This is mainly on account of the early availability of advanced technologies and greater number of technology providers across the region. Asia Pacific trails Europe vis-à-vis market share. In 2016, the region held a share of about 34% in the global pharmaceutical continuous manufacturing market. The growth in Asia Pacific has been mainly driven by China and India, which are home to numerous contract manufacturing organizations. China is considered a highly promising market because of increasing acceptability of technologically advanced continuous manufacturing and growing awareness about the advantages of the technology. North America comes in the third position in terms of market size. Initiatives by FDA to switch from current batch process to continuous manufacturing technology drives interest among the pharmaceutical companies. Some of the prominent participants in the global pharmaceutical continuous manufacturing technology market are Siemens AG, GEA group, Continuus Pharmaceutical, S K Biotek ltd, Korsch AG, Scott Equipment Company, Corning Life Sciences, and Chemtrix.